Villa Yin has been especially design to embody a unique and exceptional style which is particular to the designer insights prevalent in the villa. Located in Phuket, overlooking the Andaman Sea, Villa Yin is a private holiday home with five-bedrooms, marked with antique and vintage artwork, swanky interiors, carefully chosen furniture and a sprawling living space to compliment the rest of the property. With black-themed décor, flanked by the clear blue skies and a granite-floor swimming pool, Villa Yin is a fusion of traditional and modern accents, which come together for a good cause! The brightly coloured master bedroom is located on the upper-most level of Villa Yin and has an outdoor Jacuzzi with a sea-view and the beaches of Phuket. The room is air-conditioned and is furnished a king-sized bed. The well-decorated room has gorgeous artwork lining the walls and it also provides an office space for those who wish to get some work done. The en-suite bathroom is a lavish and luxurious space with a soaking bathtub and monsoon shower area. The guest pavilion is also situated on the top floor, and offers a private balcony with a magnificent view. It is furnished with a queen-sized bed and the guest pavilion has a living room which can be converted into a fifth room on request. The pavilion also features an en-suite bathroom with a soaking tub and a shower area. The two other bedrooms at Villa Yin are furnished with queen-sized beds and are decorated in fun colour schemes to keep the mood light and cheerful. Each bedroom has its own en-suite bathroom with bathtubs and showering areas. 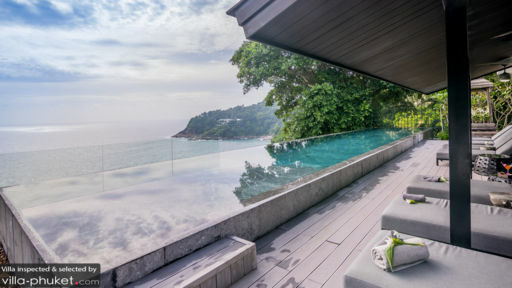 The outdoors at Villa Yin merge as one with the Andaman Sea with the infinity-style granite swimming pool. With the sea looming in front, guests can frolic in the pool or just observe the remarkable view that they have the luxury to absorb at their leisure. After a rejuvenating dip, rest up on one of the sun loungers placed on the pool deck, perfect for working on a tan or even getting some drinks while you lounge. On a separate raised wooden deck, is a sala which has a space for you lie on, while taking in the panoramic view of the sea and the tropical foliage. Villa Yin’s living area, boasts of a magnificent collection of artwork by renowned painters like Andy Warhol, and in itself is a unique concept space with black walls, exotic furnishings and artsy souvenirs and artefacts lying about the room. The high-ceiling is accentuated by designer and art deco lighting enhancing the quality of the room, and the glass walls ensure an unobstructed view of the outdoors. There is a dining and kitchen area as well in the main living pavilion, with a dining table fitted with state-of-the art dining chairs. Every bit of the space is designed with the utmost care and you are sure to be left speechless with the high-quality interiors. The modern kitchen in the corner is fitted with modern appliances and amenities. The upper-floor of the villa has a private terrace overlooking the Andaman Sea and is furnished with a dining table with rattan chairs, a mini-bar and a kitchenette/ BBQ facility so you can enjoy your meals while looking at the sea. Enjoy a peaceful and memorable time at Villa Yin, with a dedicated team of employees there to look after all your needs and requirements. The villa managerwill assist you with any recommendations you need or help around the villa, there is a house chef to cook up a storm to tickle your taste buds. 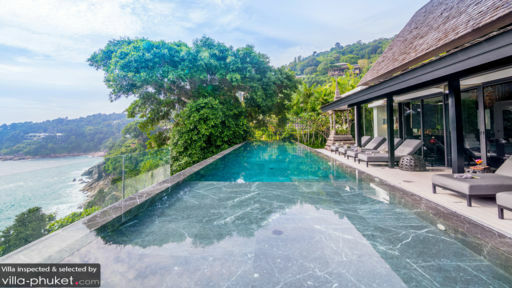 Located on Phuket’s famous shores, on a stretch termed as the Millionaire’s Mile’, owing to the many luxury villas on the land, Villa Yin is part of a private estate called Cape Amarin. The villa is on a quiet hillside yet close to all the tourist spots of Phuket including restaurants, bars etc. Very impressive service of great hospitality. We love the décor and natural surrounding. Cooking truly awesome! Our stay at Villa Yin was fabulous! The staff was absolutely helpful, friendly and the food was amazing! My best stay in Phuket ! Well done! Villa Yin in a paradise. Located on a secluded bluff overlooking the open ocean it is easy to forget about everyday life. Both Villas Yin and Yang are wonderfully designed and make for a perfect getaway for both couples or large groups.